After the Aisle Newlywed & Anniversary Package-This complimentary package covers all of your post-wedding needs—from a fresh fruit basket and sparkling wine upon arrival, to breakfast in bed with mimosas. 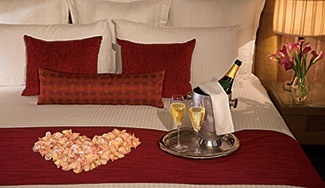 You and your spouse will also receive special turndown service one evening, as well as a 15 percent discount at our spa. Pure Passion Vow Renewal Package-Specially tailored to those who are renewing their vows, this delightful package includes a renewal of vows ceremony, a celebratory bottle of rum, a couples’ massage, wedding coordinator service and more. You may also enjoy a discount at our spa and special dining arrangements. Make the Fish Blush Honeymoon Package-This aptly named package deal gives you and your spouse all of the amenities you need to celebrate a memorable honeymoon. It features sparkling wine and fresh fruit upon arrival, couples’ massage, breakfast in bed, pleasure kit and an intimate beachfront dinner for two. We take all the stress out of planning your honeymoon. To view more details on the above packages or to book your stay, visit us online today! This entry was tagged Breathless Punta Cana, honeymoon, newlyweds, packages. Bookmark the permalink.